One of the core themes on One Straw is growing Real Food in Real Spaces – namely suburban yards. To that end we are focusing more and more on Yardening. And in small scale agriculture (by that I mean something between gardening and farming) the focus is often on yield per plant, or yield per sq ft due to the space constraints. 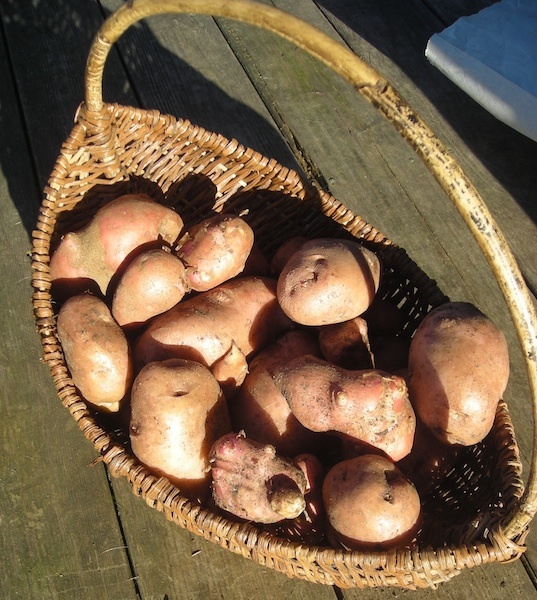 Last year I tried two separate experiments with potatoes: Potato Towers and Straw Mulch Potatoes. The towers were an unmitigated failure, as they have been for virtually everyone that I know of that has tried that method. The sheet mulch potatoes blew me away. 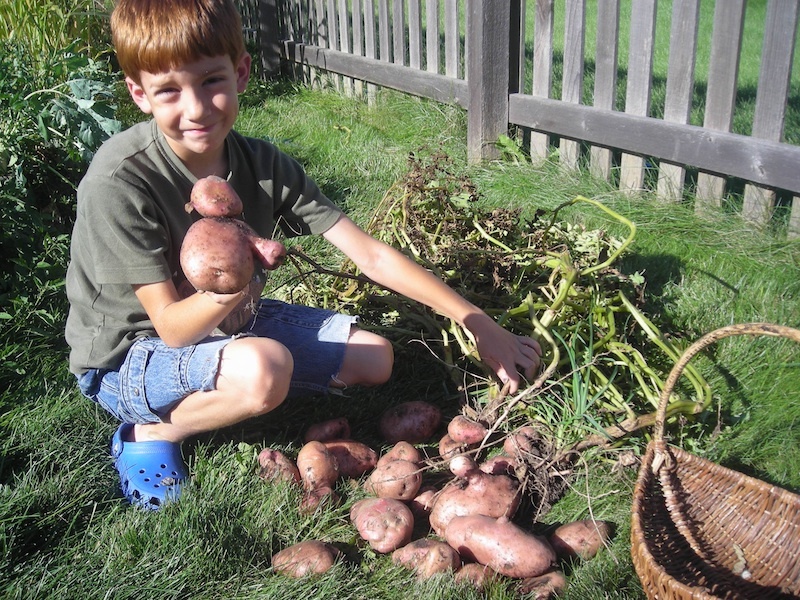 30# of spuds from 8 plants in about 60 sq ft – with a yield over 30:1. Very, very impressive considering a 10:1 yield is considered a pretty good yield. I am very pleased to say that our household has crushed that record! 9lbs, 13.5 ounces from one 2.5 ounce seed. DANG sucka! Last year I built a raised bed for our 2 children. Its 3×5 and a full foot high. To guarantee them success, I filled it with the best soil I knew of – the 10 year old farm soil at a friends place where I farm. 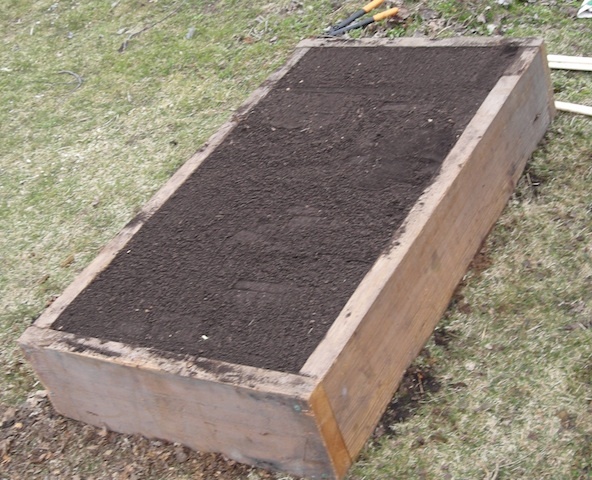 This soil was made – 10 years ago it was a 2000 sq ft of leaves stacked 4′ thick. Chickens were run on these leaves for several years, then as the composted down, 2 hogs were run over it for several years. Then it was left fallow for 3 years to mellow. 3 years ago we shaped up the compost into a very large bed with a skid steer and I began growing there. Essentially it is the richest, deepest humus layer I have ever seen – 24+” of compost. Its insane. That soil, and the desire to recreate it at our home, is why I make 5-15 yards of compost a year. One plant! 9.8#'s. I am still stunned. The kicker is that we really didn’t do anything special with it – no crazy mulching, no special manures, no drip irrigation. It has been a mild summer, with lots of rain. This was an issue in the field so much that I lost 50% of my market crop, but the raised beds apparently loved it. the only conclusion I have so far is that RICH SOILS equate to RICH HARVEST. My yields from this field at the farm are always the best, but never like this since the potato was under our attention 7 days a week for weeding and TLC. But even then, it wasn’t babied -I think my son watered it 2 or 3 times. 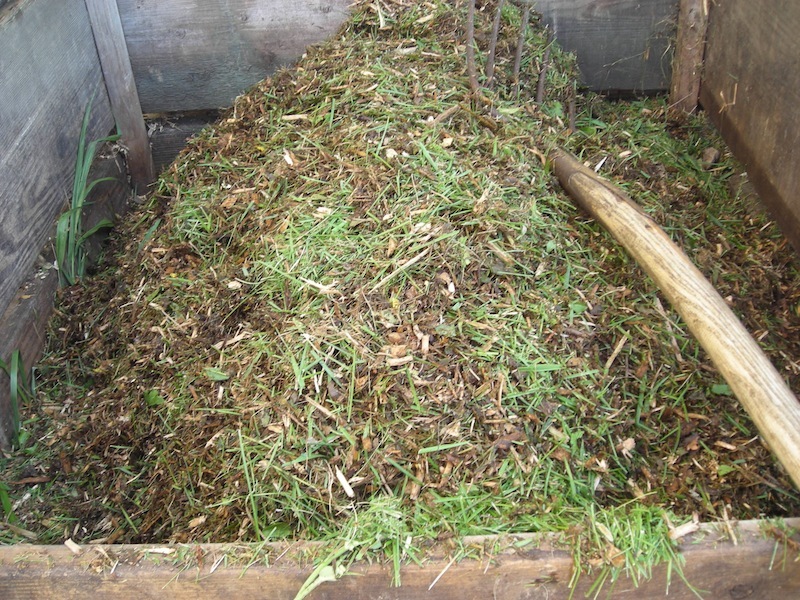 I hit it with some chicken manure in March as I incorporated the 3″ of straw that I mulched the bed with over the winter. It also got some lawn clippings around the tomatoes, but nothing crazy. No other inputs, but OMG the harvest! 3x5x1 = 200# of Produce? I really like these little 3×5 beds. We have access to a salvage yard that has hundreds of these 3x12x16′ Douglas Fir boards from an old warehouse. They are full of nails and are half falling apart, but are only $18 each. 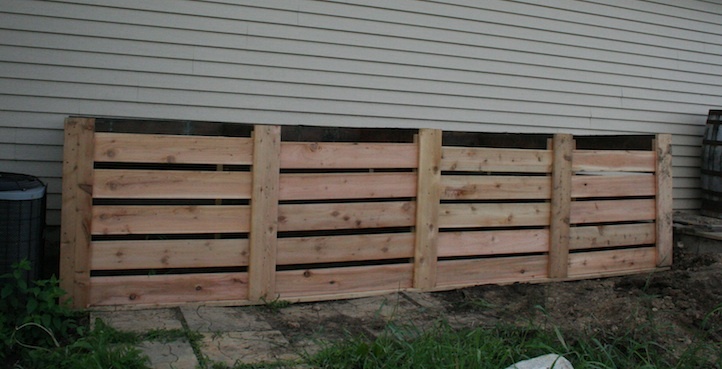 With an hour pulling nails and sanding them you have a super solid bed – they are also the boards I built my Compost Bin of Dreams from. After this little feat that my son pulled off, I am tempted to try to run 1 or 2 beds for a year to see what I can do in them in a 12 month period – they also fit perfect under my Low Tunnels. Spinach->Beets -> Potatoes (with Lettuce growing until they pop up) -> Carrots sounds like a plan to me. I bet I can break 200#’s of produce in one of these in 12 months. Finding it extraodinarily hard to find to time to write with everything thats going on (tours, workshops, Real Job, kids home, potato harvest, epic vacation planning) but The Good Work is not suffering. This post will be text only as I don;t have time to upload and edit the pics. The main updates on the ‘Midden are that the pile is cooling – down to 110. That is due as much to its age as to me tearing into it every week to tinker with the, now, primed digesters. So lets talk about those digesters. 2 weeks ago I filled one of the 55 gallon drums with ground up box elders, and the other with ground up lambsquarter. Why? Both plants are prevalent and rather despised weeds hereabouts. 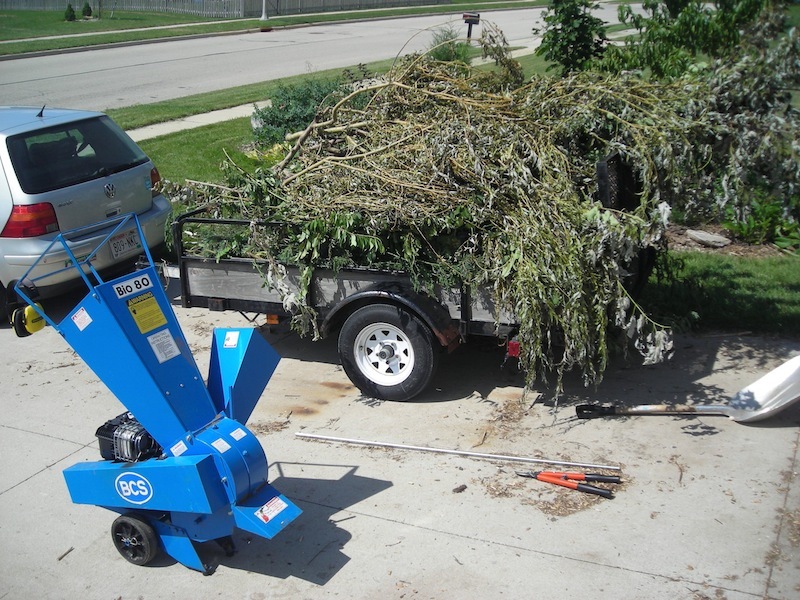 To those not sharing the local stereotypes on plants, that means that the biomass from those two plants can be had for free and in large amounts, or in the case of box elder, one can be paid to remove it from woodlots. Nice. The side by sides were to see if a more carbon rich (box elder) feedstock would screw things up. Goal in biogas production is to shoot for normal composting C:N ratios of 25-30:1. The box elder was likely closer to 40-50:1, the lambsquarter more like 20:1. Jean Pain never measured, and I like flexible systems. We *know* 25:1 will work, so lets push the envelope to see what happens. Unfortunately, 2 of my 3 steel drum lids had the bungs rusted on (snapped a bung wrench trying to open it) so I can only seal one. I choose the Box Elder. Weeks went by with nothing. 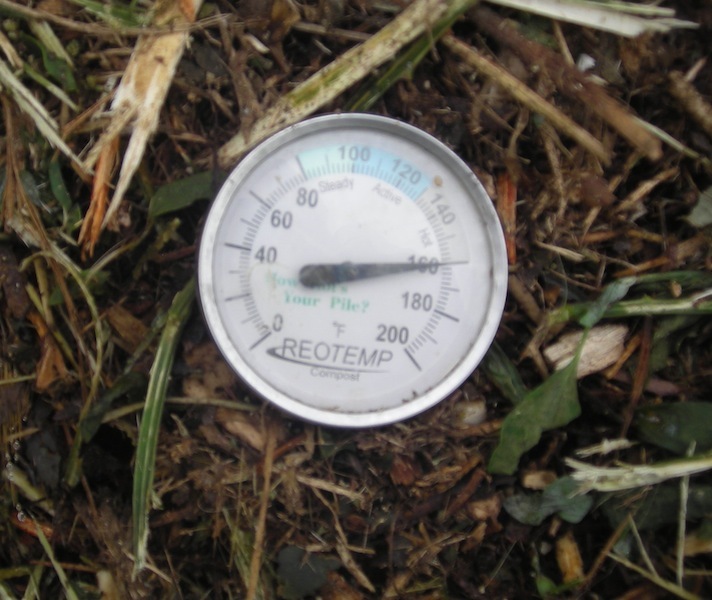 Temps are good – 90-100 with digester feedstock at 95. I should be cooking right along, but wasn’t, or if I was I wasn’t capturing it. That meant I needed to reseal the barrel as the old gasket was, well, old or that the chemistry had gone wonky. I sealed the barrel up with silicone and then I took a sample to a friend with lots of lab equipment including pH testers that give near instantaneous readings to within .01. Results – the Box Elder batch was sour. REAL sour : 4.8 ! Methane microbes like to be 6.8-7.4. Oops. Making methane is a delicate dance between acid producing bacteria and methane producing ones. I don;t know enough about the bio-0chemistry, but my hunch is that the prevalence of carbon in this digester tilted the balance, but there are so many variables. So I stopped by my friend who runs our local sewer utility and picked up 8 gallons of biosolids – the left over treated turds of our village. Our municipality sterilizes the processed effluent with lime as not many bacteria live past a pH of 12. So the left over solids are about 10.4 pH and are still high in organic matter. 3 gallons of slurry and had me up to 6.1 pH, so I threw in another 2 gallons and will test again tomorrow. I also threw in another cu ft or so of compost to reinoculate it. Why? Because I have come to the same conclusion as Will Allen at Growing Power – that compost fixes nearly everything microbial- if you throw 500 billion bacteria, spread across 15000 different species it is rather likely the one you want is in there and will thrive if you set the environment up. Fingers crossed. Back to our story. When I went into the lab today, I also tested the lambsquarter digester for pH. This unit had a different odor to it, less sickly sour and more of a deeper, more robust putrescence. It was also bubbling under the slime. Huh. Could that be methane? The pH test of that looked much better – 7.10! Right in the sweet spot. So I switched over the methane capturing lid and now the lambsquarter digester (#2) is sealed and plumbed to collect gas. Perhaps I will have video up soon of itty bitty bubbles coming out the discharge tube. If so, I will capture some and take them back to be tested at the sewer utility as they have equipment to test for methance gas quality. And since I am using their Biosolids- I now qualify as a test project so I get to use all their toys. Awwww yeah. Also staking out felling rights to several local woodlots and will likely be buying a chain saw or a wicked good axe to take down several hundred 3-5 yr old Box Elders for the next phase of the ‘Midden as we switch gear for hot water production, perhaps in September. Problem is I will be out of town for half the month and I lost my “intern” to school so not sure if I want to start it before or after. We’ll make it work. 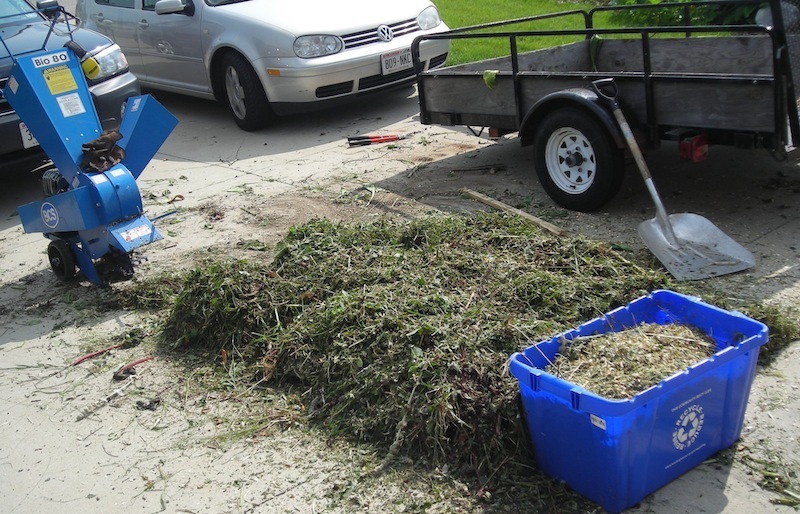 Coming up in just two short weeks will be Onestraw’s first ever Ecological Yardening workshop. Learn how in just 4 years we have worked to transform our denuded new suburban yard into the beginnings of a more sustainable system by building soils, capturing runoff, planting useful plants, and tying it all together with linked systems to magnify the results that mimic the productivity and beauty of nature. Learn more at SomedayGardens.com/events.